“Chikumaru Pass (1-Day Pass)” on sale! Unlimited rides on the Ita, Itoda and Tagawa Heisei-Chikuho-Railway lines. Passes are valid for one day. One child (Gr. 1-6) may ride for free with an adult or a child holding a pass during weekends, New Year’s holiday (Dec. 30 – Jan. 3) and national holidays. Please enjoy exploring the neighborhoods along the lines with your family and friends! ※　Please have a crew member fill out the date on your pass before use. You can receive special benefits with your purchase using your valid “Chikumaru Pass”. 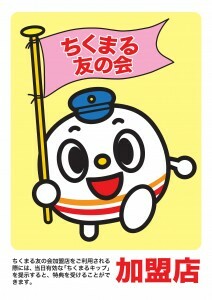 Please enjoy visiting our partner shops and facilities with your “Chikumaru Pass”. Information on our participating partners is posted at each station. Please note that the contents of the services are subject to change. Please confirm at the time of use. Information on our partners will be updated monthly. ※Please ask about the details of the services at each shop or facility. “Family Benefits” are available on weekends and national holidays. 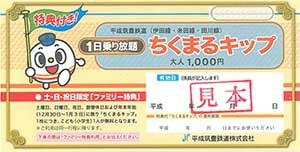 One adult pass (￥1,000) allows one adult and one child (Gr. 1-6) to ride. 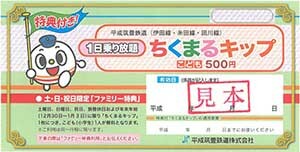 One child pass (￥500) allows 2 children (Gr. 1-6) to ride. The hot springs listed below have special discount admissions. Please ask a crew member for the boarding certificate.